Are you considering the implementation of the flipped classroom? The process of flipping the classroom involves a paradigm shift in what constitutes class work and homework. When a classroom is flipped the students receive direct instruction at home typically through the use of multimedia. When students return to class the next day they are able to apply what they have learned by working on questions, problems, or tasks that would typically be assigned for homework. There are a number of instructional benefits to this process. You can read an earlier blog posting I have written on the topic here or take a look at my wiki page on the topic. My observations have been very positive. I would like to share some of the tools that are available to create multimedia files that can be used to provide direct instruction online. Probably the most popular resource is the Khan Academy which I have written about here. In order to produce instructional videos such as the ones used in the Khan Academy, an instructor must utilize software that allows for the capture of audio as well as your computer screen. This is called screencasting. Cam Studio is a free open source download. It allows its users to screen record video tutorials and share them via a web link. It is also very easy to use. Jing is another free download offered by TechSmith. With Jing you will also create a free online account with www.screencast.com. When you record a screencast tutorial with Jing or capture an image you can save the file to your computer and upload it to your online screencast.com account. Each user is granted two gigabytes of storage space on the site. The site will provide a link and embed code for your video to share. Jing offers a free and paid pro version. With the free version you are only able to create screencasts that are 5 minutes in length. While that may seem too short i believe there is a benefit to chunking your tutorials into 5 minute increments. Screencast-O-Matic is a very easy to use screencast site. It is completely web-based. It does not require a software download. Just visit the site and click start recording. There is a free and paid version. The paid version is $12 a year. With the free version you can create a screencast that can be used by students. If you export the screencast to upload to Youtube it will include a watermark on the free version.This site also allows the use to capture his or her video from a webcam. Wink is a tutorial and presentation creation software that lets its users. 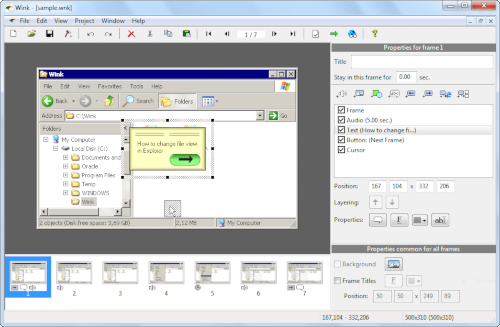 It allows users to capture screen shots, add explanations, add text boxes, and add titles. You can create very detailed and highly effective tutorials with this free software. It is free and easy to use.